Please note, this is only the enclosure! Screw-less Tool-free Design - push the button to open the top lid, slide the hard drive in, close the top lid, and you have a portable hard drive ready to use. Super Compact Design - Easy to carry around. Nice price for USB3.1. Wonder what the chipset used is? So you ssd into this ? Up to what size ? It'll take any 9.5mm thick 2.5" form factor drive (be it a HDD, SSD or SSHD). There shouldn't be a storage capacity limit though some of the larger 3TB to 5TB 2.5" HDDs are 15mm thick so they wouldn't physically fit anyways. Voted hot. 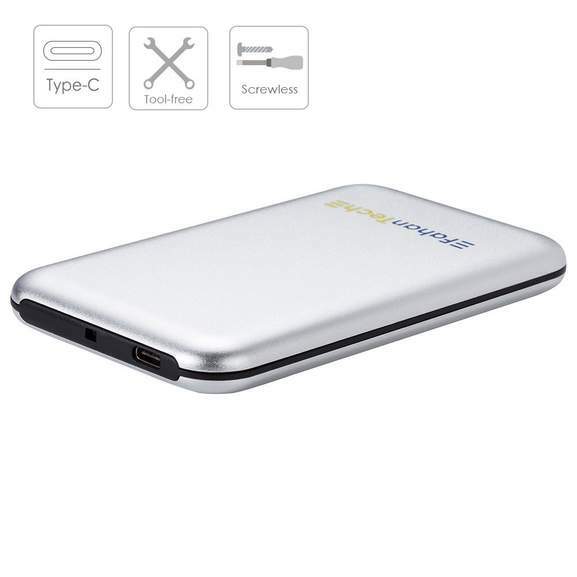 Would have bought if it supported Android phones with usb c connector. No this is not good for SSD or high performance HDDs. It's not Usb Gen 2 as far as I can see. It's £15.99 now. Still a reasonable price. the controller board in these are poor you will never get usb3.1 speeds even if you did have a drive capable inside it. So explain what difference it would make that the usb is only 5GB/s rather than 10 when the SSD inside will be limited by sata 3 speeds to roughly 0.5GB/s. Which drive would that be exactly? So explain what difference it would make that the usb is only 5GB/s rather …So explain what difference it would make that the usb is only 5GB/s rather than 10 when the SSD inside will be limited by sata 3 speeds to roughly 0.5GB/s. 3.1 Gen 1 is 5Gbit not byte. SATA 3 has higher max bandwidth. But as mentioned upthread the controller chip is the limiting factor in most of these cheap cases. Also you'd need motherboard support for Gen2 10Gbit to actually benefit fully. There are RAID 0 SSD USB externals like the Sandisk Extreme 900 that will easily saturate Gen 1 on sequential. In real life, with a usb 3.1 gen 1 box, you can have around 400mbs read/write. With Gen 2 box you can have 550 mbs.